Izzie from the executive office will visit her grandparents over the weekend to celebrate the holidays. Read what she picked out for them at Bank of America Winter Village Holiday Shops. I have no idea why, but I always struggle with what to get my grandparents for the holidays. What to get the two Jews who are coerced into a Christmas celebration? What to get the people who have been around for 80+ years and have seen more than I can even imagine? Not an easy task. I took a stroll around the Shops with my grandparents on my mind, to see what popped out at me for their gift this year. Thankfully, I stumbled upon a handful of items that will work wonderfully. First, I found myself in Natural Olivewood, kiosk K1 on the Upper Terrace, and saw shelves upon shelves of beautiful olivewood kitchen and housewares. I knew immediately that my grandma would love the rolling pins for her baking and the honey jar for when she drinks tea. Gifts for Granny abound at Natural Olivewood. Only a few steps away, Made From Coins, kiosk J9, held a plethora of options for my grandpa. An avid coin collector and aficionado, the keychains, necklaces, and other pieces would be a perfect gift for him. Lastly, I know both my grandparents love having a joint calendar hanging on their fridge, so what better than to get them a beautifully illustrated calendar from the very park I work for? 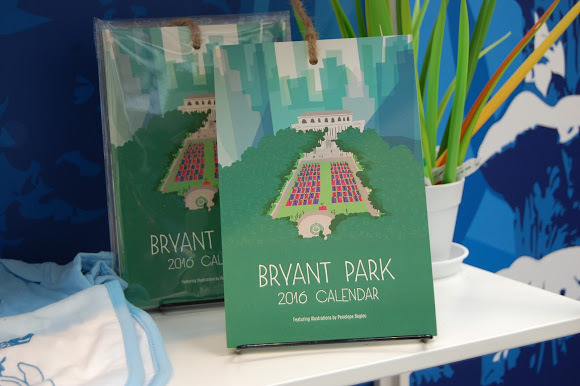 The Bryant Park 2016 Calendar, available at Park Shop & Info kiosk (A6), was a natural choice. Each page is its own work of art, featuring one of the hundreds of public events and activities the park provides each year. My grandparents will love this Bryant Park calendar. Thanks to the Bank of America Winter Village Holiday Shops, shopping for those hard-to-shop-for family members in your life is now no longer as daunting.